Homepage elements are widgetized to allow for easy editing/uploading without FTP. This template offers a wide variety of page layouts that you can customize on a per-page basis. Theme offers responsive formatting for various mobile devices. Editable files included for easy customization of logo. 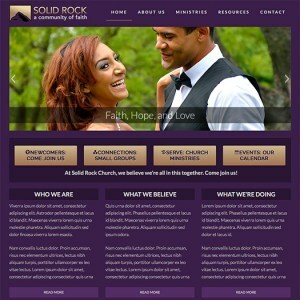 This is the latest in our robust, flexible Spire WordPress church themes. This is a power-packed church website built to run on the popular Genesis theme framework. Everything you need to get up and running is included with your download. That includes the full live demo content import file and all images you see in the live demo. You have full rights to use these images in your own website. Being that this is a fully responsive WordPress church theme, you can rest assured that this website will display in desktops, laptops and mobile devices. So if you're planning on launching a new church website, why not make it impacting - with the majestic design scheme featured with this new Spire 2 Church theme.